The share price for Marshall Motor Holdings PLC ticker lookup code: LON:MMH has risen 3.85% or 6 points throughout today’s trading session so far. Investors have stayed positive while the stock has been in play. Range high for the period has seen 162 dipping to 162. The total volume of shares exchanged through this period comes to 2,000 whilst the daily average number of shares exchanged is just 25,138. A 52 week share price high is 182 equating to 26 points in difference to the previous days close of business and a 52 week low sitting at 146.4 making a difference of 9.59 points. 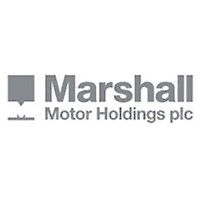 Marshall Motor Holdings PLC now has a 20 SMA of 161.48 and now a 50 day moving average at 159.71. The market capitalisation is now £126.14m at the time of this report. All share prices mentioned for this stock are traded in GBX. Mcap is measured in GBP. This article was written with the last trade for Marshall Motor Holdings PLC being recorded at Friday, September 14, 2018 at 10:37:08 AM GMT with the stock price trading at 162 GBX. The stock price for Burberry Group plc ticker code: LON:BRBY has stepped up 1.73% or 36 points during today’s session so far. Investors have remained optimistic throughout the trading session. Range high for the period so far is 2127 and hitting a low of 2086.1. Volume total for shares traded during this period was 610,628 whilst the average number of shares exchanged is 2,113,540. A 52 week share price high is 2338 which comes in at 255 points difference from the previous days close and putting the 52 week low at 1481.5 is a variance of 601.5 points. Burberry Group plc now has a 20 simple moving average of 2223.42 and now a 50 day moving average of 2184.39. Market capitalisation for the company is £8,864.59m at the time of this report. The stock is traded in GBX. Mcap is measured in GBP. This article was written with the last trade for Burberry Group plc being recorded at Friday, September 14, 2018 at 12:25:08 PM GMT with the stock price trading at 2119 GBX. Shares in Whitbread plc company symbol: LON:WTB has increased 1.53% or 71 points throughout the session so far. Investors are a positive bunch during the session. The period high was 4728 dipping to 4633. The total volume of shares traded by this point was 172,042 whilst the daily average number of shares exchanged is just 764,987. The 52 week high is 4800 around 161 points in difference on the previous days close and a 52 week low being 3499.9 a difference of some 1139.1 points. Whitbread plc now has a 20 simple moving average of 4387.16 with a 50 day moving average of 4141.95. The current market cap is £8,649.24m at the time of this report. The share price is in Great British pence. Mcap is measured in GBP. This article was written with the last trade for Whitbread plc being recorded at Friday, September 14, 2018 at 12:26:31 PM GMT with the stock price trading at 4710 GBX. The stock price for Shire PLC EPIC code: LON:SHP has climbed 2.63% or 115.5 points during today’s session so far. Investors are a positive bunch during the trading session. The period high was 4511.5 while the low for the session was 4440. Volume total for shares traded during this period was 1,249,331 while the average shares exchanged is 2,358,457. The 52 week high for the share price is 4576 which is 186 points difference from the previous days close and putting the 52 week low at 2940.5 a difference of some 1449.5 points. Shire PLC now has a 20 SMA at 4459.71 and the 50 day moving average now at 4427.89. This puts the market capitalisation now at £41,021.57m at the time of this report. The stock is traded in GBX. Mcap is measured in GBP. This article was written with the last trade for Shire PLC being recorded at Friday, September 14, 2018 at 12:26:20 PM GMT with the stock price trading at 4505.5 GBX. The stock price for Kingfisher plc ticker lookup code: LON:KGF has climbed 1.74% or 4.5 points during today’s session so far. Traders have so far held a positive outlook throughout the trading session. The periods high has reached 264.81 while the low for the session was 259.5. The total volume of shares traded by this point was 2,868,195 whilst the average number of shares exchanged is 10,183,506. The 52 week high is 366 which is 106.8 points difference from the previous days close and the 52 week low at 257.1 which is a difference of 2.09 points. Kingfisher plc now has a 20 SMA at 274.49 and a 50 day simple moving average now of 292.93. The market cap now stands at £5,620.23m at the time of this report. All share prices mentioned for this stock are traded in GBX. Mcap is measured in GBP. This article was written with the last trade for Kingfisher plc being recorded at Friday, September 14, 2018 at 12:26:02 PM GMT with the stock price trading at 263.7 GBX. Click BRBY KGF MMH SHP WTB for the full archive.